These notes aim to give basic idea of the main criticalities related to HV shunt reactor switching, particularly in terms of voltage, and how such problems are faced and solved by modern switching technology. Three-phase shunt reactors are basically aimed to compensate excess of reactive power generation so preventing unacceptable voltage rise and power losses. Lightly loaded1, long power transmission lines over 220kV, or cables 100kV and higher, are capacitive loads causing voltage increase because of the line charging currents flowing through the line / cable self inductance (Ferranti effect). In this cases the reactor is switched on and off during the day depending on the load, only. In fact, due to the need of reactive power consumption for voltage control and electrical system safety, the shunt reactor should be never tripped: in case of reactor fault, the whole line is tripped. 1 As a reference value, it should be considered as “light” a load less than 70% of the surge impedance loading (SIL). For instance, a 345kV line with surge impedence 350Ω has about 3452/350 = 340MW SIL. That is consistent with the fact that in some EHV lines permanently under-loaded, fixed reactors are installed (provided just with a disconnecting switch in presence of redundant shunt reactors, for maintenance purposes). 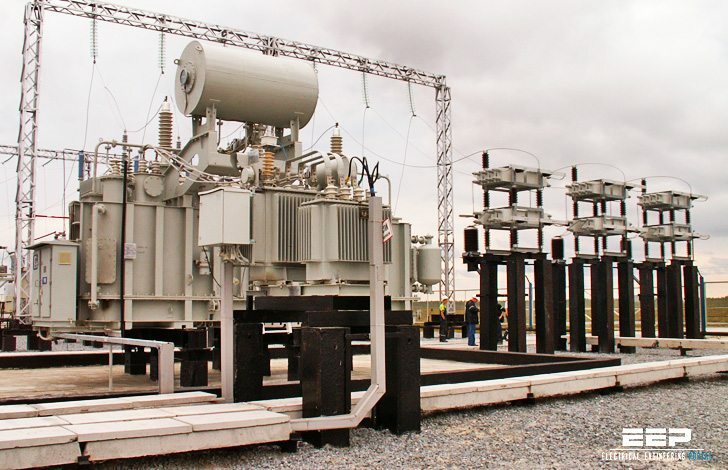 Another example of shunt reactor application is in presence of filter banks acting as capacitors at power frequency: that is the typical situation of HVDC converter station. HVDC converters produce harmonic distortion that need proper filter design to avoid heavy impact on network power quality. Different combination of filters could be are foreseen in different load conditions to get the target value of THD. At the same time filters’ capacitor banks act also as a reactive power source providing the needed Mvar to the converter, which is an important inductive load. Sometimes it could happen that specific combinations of converter load and filters configuration can satisfy the harmonic constraints, but lead to the reactive power generated by filters exceeding that consumed by converter over acceptable level: in that situations a shunt reactor is used. The configuration of shunt reactors may be various (bank of single-phase reactors, three-phase unit with a 3- or 5-legged core, etc.) , but following considerations still remain valid. It is to be noted that shunt reactor is, by definition, a reactor directly connected to the network; in some applications reactors are applied through a transformer (e.g. connected to tertiary winding); in both cases the principle is the same and the reactor acts as a linear inductance2 , but this paper refers to the first. On the other hand, despite the different possible earthing methods (isolated, solidly earthed or earthed through neutral reactor), solidly earthed three-phase shunt reactors will be considered. 2 In case of iron core reactors, linearity is obtained with integrated air gaps. For what concerns the closing operation, the shunt reactor can be simply modeled as an inductance in series with a resistance. The latter is always present, despite the effort to minimize losses. reaches its maximum value (γ = 90°). On the contrary, the transient term will be maximum if the circuit breaker closes with γ = φ ±90°. In the simplified example that means γ = 0. As the two terms (transient and steady state) sum each other, half a cycle later, when they have the same sign, the current increases over the steady state maximum value. The actual value depends on the circuit damping. Very low damping circuits (it is almost the case of shunt reactors) can see a current doubled, compared with the steady state. In three phase circuits, with three-pole operated circuit breakers it is quite easy to meet a critical closing instant on at least one phase. Because of above mentioned asymmetry in the transient current trend, closing operation can also generate zero sequence currents. Despite of the linear design of shunt reactors, in case of their switching in at the worst instant (phase voltage equal to zero), the flux will increase with the voltage-time-area during the first half-cycle to a value twice the maximum flux in normal operation. The current is proportional to the flux density, until reactor core saturation occurs. Above the point of saturation the current will increase faster than the flux. Saturation will be present in different amount in the three phases, because of the three-phases voltage 120° displacement. That means the sum of DC components in the three phase currents will not be null, so producing a zero sequence current which could lead to nuisance tripping by protections. The way to mitigate the high inrush currents and generally, the switching transients, due to random closing instants is to control the making instant for each pole of the circuit breaker. That means a single-pole operated circuit breaker is needed together with a Controlled Switching Device (CSD). Several manufacturers offer their own models of CSD: basically the principle is the same and it is based on the measuring of voltage upstream the circuit breaker, on the source side. In several cases a current feedback signal is used for adaptation control: as the switching times can be affected by temperature, auxiliary voltage variations, mechanical contingencies, etc. a deviation from target instant can occur. Such deviation is detected and properly taken into consideration during the next operation. “Switching Shunt Reactors” – Roy W Alexander, NeilA. McCord P.E. Electrical Engineer from Italy. Experience in power plants electrical systems, as technical coordinator. Now dealing with High Voltage systems. In the Tech Article “Talking About HV Shunt Reactor Switching (part 1)posted on 29th July2013posted by NICOLA HV transmission and Distribution ” Lightly loaded, long power transmission lines over 220kV, or cables 100kV and higher, are capacitive loads causing voltage increase because of the line charging currents flowing through the line / cable self inductance (Ferranti effect). Please Note: Ferranti Effect is due to the Capacitance and the line charging current of idly or lightly loaded Transmission lines 220kV and above which causes this /similarly too in case of Cables of 100kV and above ,whereas it is shown as “inductance(Ferranti effect)”.This may please be got corrected. I am learning much more in your website compared to what I am learning in my workplace and the internet combined. Thanks to all this so greatest work you are doing. Specially “my daily dose”. I would like to ask you pleas, about a tranfomator’s resonance, and what a normalize value defined by a standars of TR 3MVA. With a supply power at 22kv/6, 3Kv?. A lots of thanks and admiration for your efforts.!!!! !